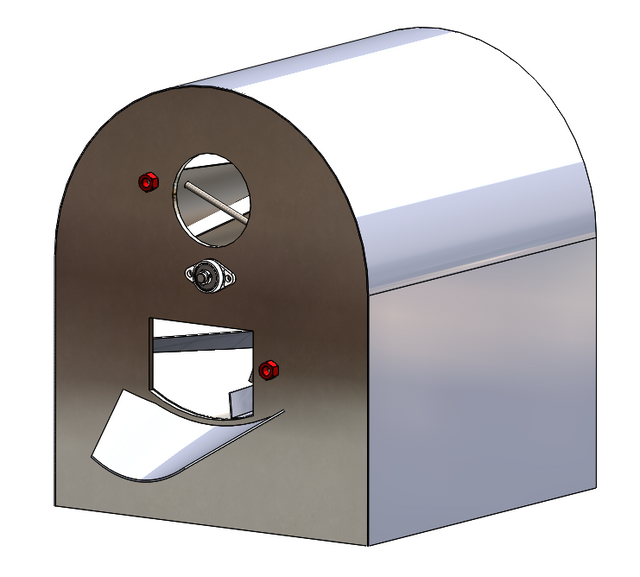 I have started designing my own drum roaster, and getting parts for the build. - Want to be able to roast from 1/2 - 1 lb of beans at a time. - Will use Artisan, Yocto Thermocouple and 2x K-type thermocouples for temperature reading. - Drum is currently planned to have ID of ~23cm, and length of 25-30cm. Drum is being made from a casserole colander. - Planned drum rotation speed is 55rpm. - I have an inline 4" fan with speed (voltage) regulator. - Planning to make a simple cyclone separator for chaff. A couple of screenshots of the design at its current stage attached. - Heating source - gas or electric? Unit will be outside but under roof, in climate varying from 18 to 32 degC. 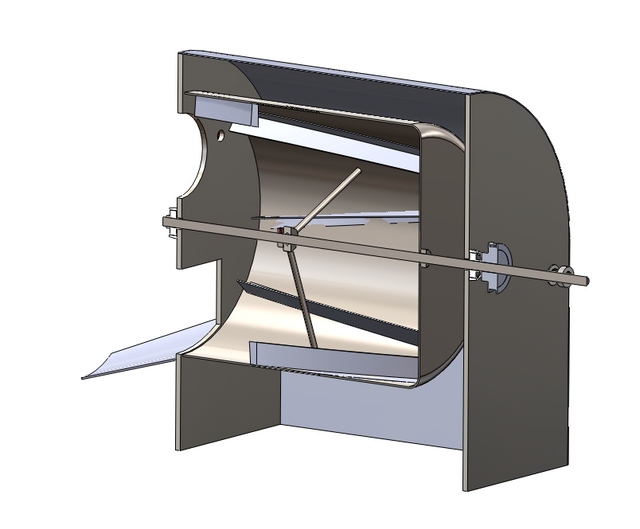 - Should I place fan at air inlet or somewhere downstream of the roaster (after cyclone) ? - Does the planned drum diameter/rotation speed sound right? - How much should I expect to be able to roast at a time with the drum dimensions given? - Do you see any mistakes in my design? The drum size is too big for 1lb, using the 6 liters for 1 kg of greens rule. The typical size for 1 kg is a "square" cylinder 20x20 cm, so 1 lb should be even smaller. Your drum is appropriate for significantly more than 1 kg... compute volume and apply the rule from above. Best speed depends on load volume, and complete bean temperature probe immersion, is not the same for 300 grams and 600 grams. Fan placement implies also the fan type/build, if on exhaust you need a high temperature fan, much more expensive. 1. Experiment with local beans. I am currently living in Angola, which used to be the second largest coffee exporter until its independence/civil war. Most of the coffee grown here is Robusta, which doesnt interest me. I am looking to identify sources of high quality Arabica. 2. Roast my own coffee for me, family and friends. There is of course a third reason - the desire for making something with my own hands. I know it will be a lot of work but the pleasure isn't just in having a well-functioning roaster but in enjoying the tinkering to get there. I will look into downsizing the drum somewhat - will see what I can find that is suitable to build around. The few machining shops I could have used around here are extremely expensive as they are only catering to the oil&gas industry. On the other hand, using your 1kg/6liter ratio, this should make mine suitable for around 1.6kg green beans -> 1.1kg roast. Not too big I think - not the least because I will probably have to buy local beans in sacks. I'm likely to start building in mid-May, will share failures and successes as I move ahead. I am losing about 16% at a roast as average... 12-19% is the whole range I experimented. I am roasting maximum city+, never going in SC. So 1.6 kg of greens equates to 1.37 output, for my roast style, maybe you roast much dark. A drum suggestion from another builds here, maybe you can start easier with a pasta strainer, there are 6qt models very suitable as 1 kg drum. If you search more the forum, you can find whole setups made from stainless steel kitchen ware, implying no tinkering or welding, just drill and screws. Please be aware that over 1 kg the chaff management, smoke and cooling beans becomes a challenge... is good you planned a cyclone. Any link for the exhaust fan you are aiming ?